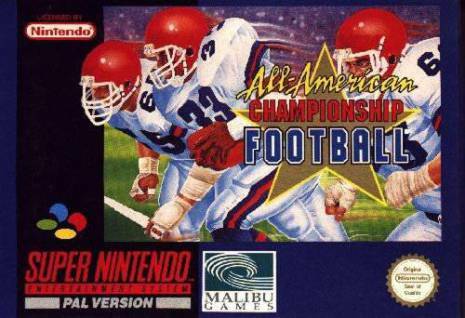 All-American Championship Football is a multiplatform sports video game that is licensed by the leading sports magazine, Sports Illustrated, which features both American football and baseball games. In the American football mode, players can play a complete season of 16 games plus playoffs with 90 different players for both teams. Sometimes, the camera zooms in on the action in American football mode when a play is significant enough to affect the overall game. Baseball mode gives the players 28 unlicensed teams in addition to various offensive and defensive plays. Both season modes come with complete league standings, a complete team/league schedule, and team comparisons to each other prior to each game.